IR photography is fantastic for getting a look that is unlike any other within the photographic medium. 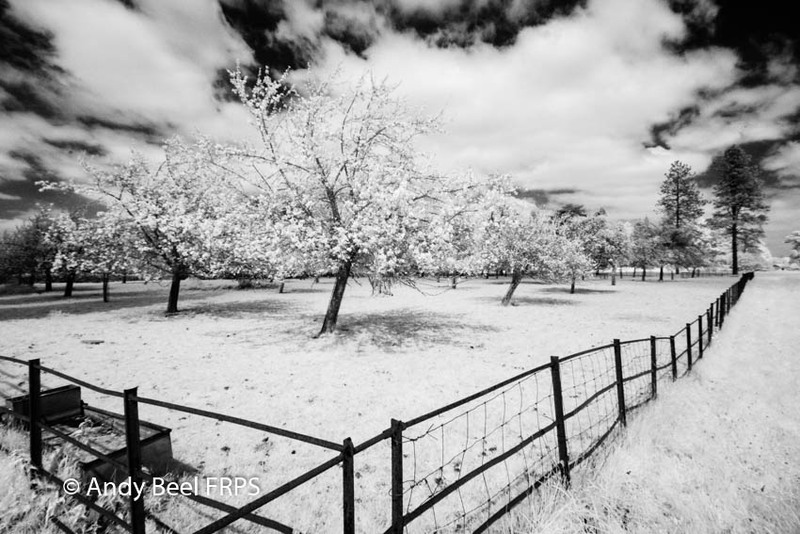 In this post we will be looking at five ways for you to improve your Infrared photography. Also in this post I will be sharing with you the workflow from digital negative out of the camera to the finished picture. Many of us have old digital cameras lying around that are way out of their warranty date not doing anything. These old cameras can have a new lease of life with some modification to how they see the world. In 2007 I had an old Canon 20D converted to see IR light only, at that time there was nobody doing the conversions in the UK. Now there are many companies in the UK offering IR conversions such as Advanced Camera Services, Protech Photographic, Infrared Camera Conversions. Mentioning these companies here is not an endorsement just a flag to demonstrate who is out there offering these services. A conversion is a simple process of removing the filter in front of the sensor that is blocking infrared light and replacing it with a filter that allows certain wavelengths of IR light through. A replacement filter will come in various options for a lesser or greater infrared effect. On most websites when describing an infrared filter there will be a nano meter number ascribed. The most common infrared filter is a 720 nm but for stronger infrared effects, the higher the nanometre number greater the effect. It is possible to get an 830nm filter with a special coating to reduce the possibility of hotspots from Kolari Vision in the US. (See the link to Kolari Vision below). The main difference between visible and IR light is the wavelength of each focuses in a slightly different place. Infrared light has a longer wavelength than daylight and it focuses behind the point that they daylight focuses. So for a photographer using a digitally converted camera it is suggested that you have a range of measures to deal with this feature of IR photography. Many infrared photographers automatically choose a wide-angle lens with a small aperture to create depth of field to cover the loss of critical focus. Another way is to ensure that any commercially camera and lens combination is calibrated to accurately focus infrared light. This should be part of the conversion process. Therefore you will need to choose a lens to use with your infrared converted body. When the focus calibration is carried out, say with a zoom lens, the focus calibration will be set at the widest focal length. One of the challenging aspects of IR photography is choice of an appropriate lens. When choosing a lens to work with infrared photography you must be sure that hotspots and flare are kept to a minimum. If you are using a lens that creates hotspots, from my experience you will not be able to remove the hotspot in the post-processing. Therefore it is imperative to get the hardware right. One of the challenges is that with any lens a hotspot may be created in some apertures and not others. The ideal situation is that you can find a lens that does not create hotspot in any aperture. Fortunately, there is an on-line database of good and bad lenses for infrared photography. This database covers the vast majority of lenses manufactured by the following providers: Nikon, Canon, Sigma, Fuji, Sony, Olympus plus others. As the compilers of the database openly say it is not 100% accurate as it has been created from a number of different sources. However from my experience, using this Kolari Vision database saved me £650. I was thinking of using a Sigma 12-24 mm Mark II lens on a converted Canon 5D Mark I body. The database told me only the Mark I of this lens is suitable for infrared photography, however, the Mark II version creates hotspots. If you are buying bodies or lenses for IR pictures makes sure they will work together. The IR effect comes about when different surfaces have a greater or lesser propensity to reflect the infrared spectrum. 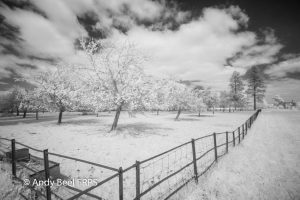 The reason why infrared photography creates such an otherworldly look is because not all surfaces reflect the same amount of infrared light. As an example, we all know that grass has a very strong infrared effect showing up in light tones in a infrared picture. At the other end of that scale, water does not reflect much IR light and therefore has the effect of showing up as a dark tone. Factors that affect the quality of the reflectance of infrared light are the time of year, whether the sun is shining or not, the chosen subject matters ability to reflect infrared light. My suggestion is that you treat your infrared converted body as though it is a normal camera body and use for absolutely any subject. See what you get there is a huge amount of serendipity connected with infrared photography. There is not an absolute failsafe conversion when discussing how an infrared picture may or may not look once it is processed. So be brave and try anything to see what you get. When using a converted camera body there is a greater need to use exposure compensation and bracketing depending on the time of day and the amount of reflected infrared light. The picture on the left is the digital negative straight out of the camera without any processing. The image on the right is the desaturated version without an increase in global contrast. If you have been doing Infrared photography for a while you will know that the resulting digital native coming out of the camera will be of low contrast. Therefore, the post-processing workflow apart from converting to black and white is about increasing that lack of global contrast. The pictures in this post show where I started with this particular picture taken at Barrington Court in Somerset and the final feature picture shown above. For you to have an effective post-processing workflow exposure must be reasonably correct within the camera to preserve the highlight detail. I process all my pictures now in Adobe Lightroom CC. The workflow in essence is to convert a black-and-white by desaturation, using the tone curve to increase the contrast of the picture by making the curve steeper, adding selective sharpening so the sky is not sharpened and lastly darkened the edges of the picture. If you would like to learn more about ways to improve your infrared photography join us on the one-day workshop coming up on the 19th July at Stourhead in Wiltshire.. Thank you Andy . I wish I had seen this before I got into difficulties .A 720 nm converted Canon 7D with a 24-105 mm lens no problem . When I tried using a markii 24 – 70 mm f/2.8 lens I got a hot spot . Thought that the camera had a fault so I bought and converted another Canon 7D. That is when I discovered about camera and lens combinations giving hotspots.